Atlanta, GA, November 9, 2018: Georgia Governor Nathan Deal presented well-known gastroenterologist and Emory University School of Medicine clinical professor Dr Indran Indrakrishnan with an official commendation on September 25 for his work in the medical field. The commendation was presented to Dr Indrakrishnan on his birthday, making him the first physician and the first American of Indian descent to receive such an honor. “Dr. Indrakrishnan’s exceptional work has improved the lives of many Georgians affected by colorectal cancer and other gastroenterological diseases. Through his service, he has earned the respect of friends, family, colleagues and his fellow citizens,” the commendation says. 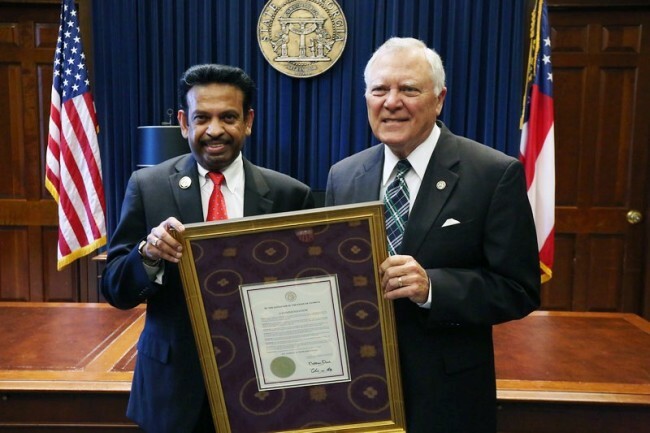 The Georgia Senate had also passed a resolution in 2017 honoring Dr Indrakrishnan’s service to Georgia. The Georgia House of Representatives honored him with a resolution declaring February 14th 2018 as Dr Indrakrishnan day. Dr Indrakrishnan was also named among the 25 Most Influential Asian Americans in Georgia twice- in 2016 & 2018. Dr. Indrakrishnan is a former president and board member of the Georgia Gastroenterology and Endoscopic Society and currently sits on the Georgia Board for Physician Workforce, as well as the boards for Rainbow Village, Fight Colorectal Cancer and other community groups, according to the commendation. He has also served as a “Doctor of the Day” during 10 legislative sessions. He is a Leadership Gwinnett graduate also.